Our girls love fresh berries of any variety—so when I was able to buy pints of berries for less than $1.50 last week, I stocked up. I guess I stocked up a little too much with too many different types of fresh fruits and the raspberries fell by the wayside. Growing up, we either ate fresh berries as a snack—or baked into some sort of dessert. I needed something to use up one last cup of raspberries—without turning it into a sugared pastry. It was time to make my own raspberry vinaigrette salad dressing recipe using fresh raspberries instead of one made from raspberry preserves or raspberry vinegar. Combine Ingredients in blender or food processor. Add the raspberries, mustard, Red Wine Vinegar, honey, broth, olive oil, salt, pepper, and oregano into the pitcher of a blender or food processor. Blend until smooth. Check seasonings. The sweetness of the berries used in this recipe greatly affect the amount of vinegar, honey and seasonings--so while the amounts listed here worked well for my berries--you may need to adjust things! Take a taste test and adjust the honey, vinegar, salt or pepper as needed. 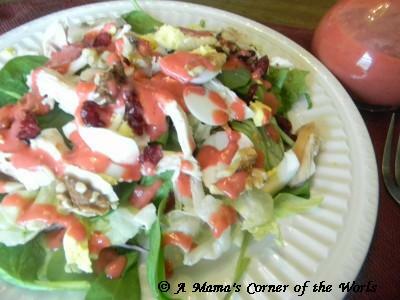 I would recommend tasting the dressing with a bite of the intended salad since the flavors of the dressing are intense and may seem stronger without strong greens or other salad components!. Cover tightly and refrigerate. I use a stopper-sealed salad dressing bottle for storage and serving—but, a bowl with a lid works well also. Refrigerate and store for up to 3 days. Shake well before serving. We serve over a dark green salad (spinach or spring mix) with bread sticks.